Thanks Ingrid-I caught both @ home and MoM? eating. Apparently, Belle has some type of leg injury. From reading the description, there has been an intruder in the area that both have had to contend with. 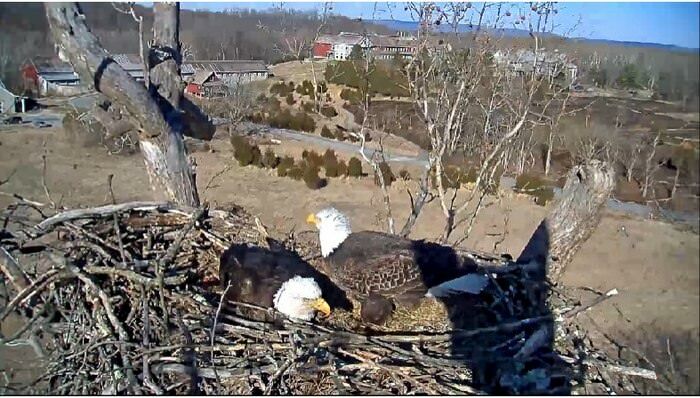 another mating in nest an done lay down in nest and they both just left at 6:33pm I think good sign. and if it is a new pair, ( it will be sad as I love d this pair also ) but better than no one interested , I really am not an authority on this pair and have been looking for spot on males head. no one seems to know. and if Belle, she has had time to heal. I am a sucker for punishment. 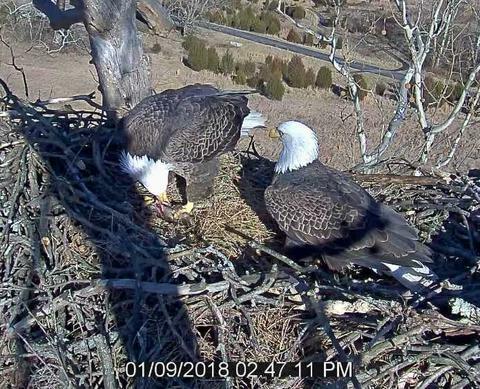 male has laid in nest bowl today with female there. we will see how this transpires also. some say it is new pair, some say it is at least Shep and some still hoping for Belle and Shep. I really do not know. when they are not banded , it is a poo shoot , unless there are some markers to look for. I know shep had a dot on his head. I have not been able to get a good look . when will I have time for falcons but these things intrigue me. I will post some pictures here later but all is looking towards , maybe a few eggs. I always miss early morning but I saw one mating at nest. they were on 5 times that i saw. he is restoring nest and they both work in nest. no time for pictures from march14. should be able to post a few today at days end. as I said , do not know if this is shep. if they manned the cams and pommeled in on him, could tell better , bu t I do think this is a new female. I made extra work for myself but I decided to monitor this site because it was one of my first eagle sites to watch. this and Maine. (no longer a cam at Maine.) I watched many miracles happen here after fierce snow storms, where the eagles were buried. I watched before shep. I believe Liberty was the males name before. I remember the season he was ousted. they had eggs and dirty spot we called him , would not let him or Belle back to incubate . it was heartbreak times. but we all came to love the male ( an d he was called Shep). when i saw Belle was injured, I came over to monitor. now this sis probably new female and I an not sure if Shep. ( I would have ot see his head form above) but we have a male an d female and if you read my above posts, you will see things have been progressing. they have been mating , nest building, she ate on nest today. ( I have recorder on and run it of f and take notes a some photos for proof. some people need the proof) this has been taking up a lot o f my time but something that appealed to me. I will not be able to continue monitoring at this pace but i have two cams running on my other computer right now , so as not to take away from the falcons. another good day here at the nest. I expect eggs soon. they were here so often. there were two mating's , one at nest and one in far off tree branch. sometimes they came alone and sometimes together. they both lay in bole. female is comfortable to stay at nest alone. just before dark, male came in with a wee bit of prey. I think he brought it for Female but she was not there so he ate it. there is no egg yet, bu t soon . he brought in a squirrel which she immediately took. they were there till dark again. straw brought tin and he arranged sticks. 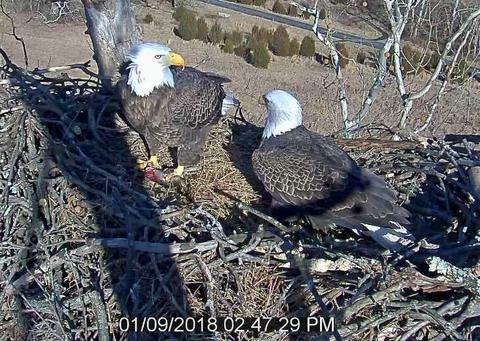 I tuned in at 12:24pm- th e female was in several times by herself. she found a scarp one time. he bourgh tin prey at days end and she stayed on et an date. march20. it i ssnowing at nest right now. ealges were there for quite awhile early morning beofre snow.